Wayne's Take: Do you earn less then $200,000 a year? Sorry Mitt says you aren't making enough to be middle class! Do you earn less then $200,000 a year? 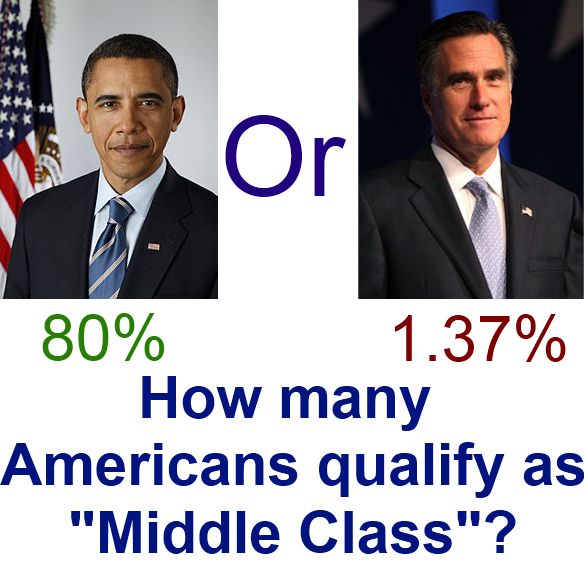 Sorry Mitt says you aren't making enough to be middle class! Then you aren't even "middle class" according to Mitt Romney. Don't feel sad because 95% of American house holds don't make enough to be labeled as "middle class" according to Romney. In a flash of honesty and for the first time Romney is putting some numbers to his economic plan. He states that he considers the middle class to be 200k-250k per year. We already know he wants big tax breaks for those that earn 250k+. He want to keep middle income earners tax burden "low" and well he won't talk about poor people except to say "not concerned about the very poor" despite the fact that his economic policy would require most of the safety nets low income earners depend on to go away. This is the world Mitt Romney lives in. In an America where 83% of house holds earn under $100,000 a year. Where 72% of house holds earn under $75,000 and still over 54% of house holds earn under $50,000 a year, Mitt Romney will look after the 1.37% of Americans that qualify as "middle class" by his definition by keeping their tax burden as low as he can. He's got one interesting thing going for him. There are less households that earn $200,000-$250,000 a year then there are that earn over $250,000. Wait oh sorry...I've used figures from 2005. The latest census data has that number of Mitt Romney's "middle class" has drop by over 15%. 97% of American households are defined as "poor"
"not concerned about the very poor"
Plans to increase the tax rate paid by the "poor" by about $1,600/year. Watch Romney and Obama both describe who they think is "middle class"
My cousin say " If you live in California 250k is middle class and Obama is an idiot. He is a socialist and should move to Europe." 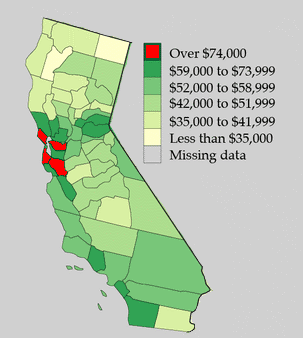 Lets look at the mean household income of California. Seems people can be ignorant of what it is like in their own state. That is not exactly what he said. What he said was "No, middle income is $200,000 to $250,000 and less". Leaving out the "and less" part is distorting the meaning.